At Seen in the City, we’re all about those hidden gems. 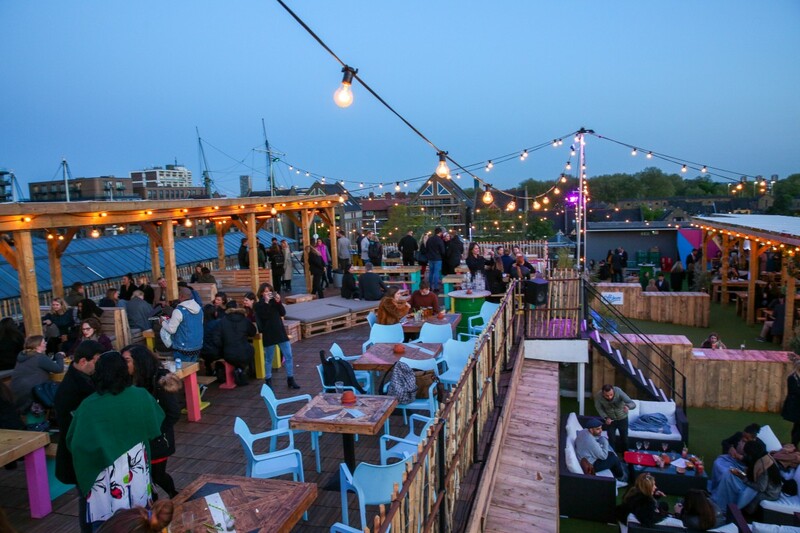 Skylight Bar at the Tobacco Docks is our latest discovery and we almost don’t want to share! When I say “hidden gem”, I’m not joking. Tucked away in a converted car park on the fringes of Tower Hill, Skylight Bar is easy to miss. You really have to dig into the alleys of the Tobacco Docks to find it. Once there, no one would blame you for thinking you’re in the wrong place when the security guard directs you through a literal car park. It’s only when you reach the rainbow painted steps (three flights of them) that you’re assured you’re definitely headed to a bar and not to your untimely demise in an American action movie. Yet what you emerge into at the top is well worth the wait (and the climb). It’s rare to find a venue that has so much space in London, and the use of the space is pretty amazing. Think indoor quoits (horseshoes for you laymen), games rooms and street food pop-ups serving hot Mediterranean food and foil-wrapped burgers without the frills. Photography by CPG Photography Ltd.
Set upon multiple levels, you can explore the warren of games options underground or head to the rooftop bars (yes, bars plural). Here you can cosy up in blankets under outdoor heaters or warm up over a beer and croquet. Have you ever played croquet on a rooftop bar? No, neither had I until I visited Skylight. I’m also told that the entertainment changes from season to season. Outdoor games in the summer, ice skating and igloos in the winter. Genius. One of the unique things about Skylight is the view from the top. It’s rare to see the London skyline from this far east of the city. What’s more unusual is the uninterrupted view you get of the city’s skyscrapers. Sure, there’s plenty of industrial works surrounding the area – it’s going through considerable development, which makes me wonder how long this view will be available. For the time being, however, save the odd crane or two, the Skylight Bar offers an incredible apex from which to enjoy the capital’s stunning landscape. You can book out benches and corners for corporate dos or birthday drinks, reserve gaming zones or head there for a romantic night from sunset to starlight. Your date won’t be disappointed.